A group of survivors and close friends of the Ghost Ship fire victims delivered what they are calling an "Open Letter to Mayor Libby Schaaf" this afternoon. More than 1,000 community members also signed the letter, which demands that that mayor enact an "emergency eviction moratorium," in addition to to implementing housing-policy reform. Organizers from the art and music community created a Google Worksheet, which includes more than 1,000 signatories to the letter, plus personal comments on the fire's impact. The mayor has said that City Hall is reviewing its fire-inspection policies, and but that there is no intent to go on a "witch hunt" against Oaklanders living in non-conventional spaces and warehouses. Meanwhile, those living in these spaces are experiencing an uptick in inspections, by both the city and landlords, since the December 2 tragedy. (1) Announce an emergency eviction moratorium. Out of panic or opportunism, property owners are rashly ousting tenants throughout Oakland. (2) Publicly pledge to offer a clear path forward for artists’ spaces to address safety concerns without risking expulsion. (3) Reassess the housing policies that lead people to live in unsafe residences. (4) Reassess permitting policies that exacerbate unsafe performance spaces. Do so with input from the music community that just lost so many of its pillars. The importance of this last demand is illustrated well by the case of 21 Grand - a venue that did everything it could to legitimately host experimental music but was stymied at every point by an arduous city bureaucratic process. This is the context in which people adopt unsafe performance spaces. 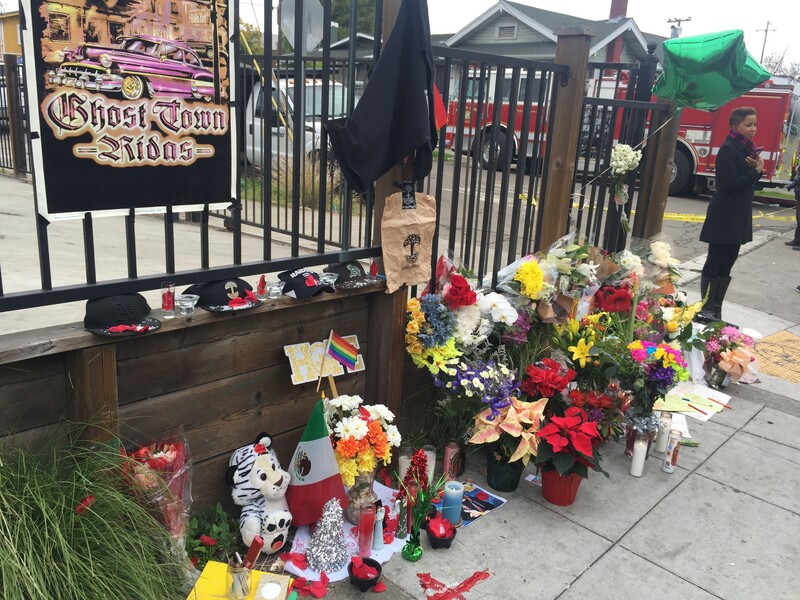 The vast majority of the victims of the Ghost Ship fire did not live at the residence, but were attendees of the event that was thrown there. It is no coincidence that so many victims of the fire were queer, trans, and/or people of color. The media frequently seeks to mischaracterize our collective spaces as hedonistic playgrounds. This is a gross distortion. They are sacred spaces that allow us to survive, organize, and flourish in the face of a mainstream culture that often shuns our very existence. Shuttering the spaces that allow us to safely congregate is tantamount to extinguishing our livelihood. In the aftermath of the fire, developers and landlords have ramped up the systematic displacement of individuals residing in warehouses and other such improvised homes. As artists, we have been greatly impacted by their actions; however, we understand that these recent threats to our housing are but a facet of the broader context of gentrification that has long displaced marginalized citizens of Oakland, including people of color, queer individuals, the disabled, the elderly and other low-income residents outside of our arts communities. Continuing to shutter and penalize collective spaces at this time will only exacerbate displacement; it teeters the housing-insecure towards the streets. You have publicly expressed your desire to defend Oakland’s diverse artistic and musical community. You have the chance to prove your commitment to this goal by acting upon each of our aforementioned demands. Express Writers Take Home Six National Awards at Association of Alternative Newsmedia Gathering in Washington D.C.